Classic Kiwi Bach - clean and tidy and completely modernised. All the modern conveniences including dishwasher, front loader washing machine and outside shower (hot) for an easy relaxed stay. Plenty of off-street parking, and good size grassy area. Complete indoor - outdoor flow and a completely fenced property. A 2 minute walk to both top bunks - this arrangement works very well. Two bathrooms one with separate toilet. Please bring your own linen - sheets, pillow slips and towels (we have duvets on all the beds). Duvets and pillows provided but bring all other linen. Minimum stay over weekend Friday and Saturday nights. Minimum stay over peak holiday periods; please inquire. We have been holidaying at Whangamata for over 20 years so know the area really well. Let us know what you'd like to do during your stay and we will able to help put together a really memorable stay. Our property is the classic kiwi bach - open plan living, designed with summer living outdoors. We converted a small classic property into a modern spacious area - kitchen, dining and lounge. It cosy, comfortable and nothing precious! The kitchen is very well appointed, with all the 'mod cons' ready for your perfect summer holiday. The bedrooms are in a separate building which was once garage - we love this because it's quiet and calm and away from everyone, when you want a lovely snooze in the afternoon or if you want to get away from the children. Plenty of off street parking, down a quiet driveway and the property is fenced. Bathroom recently refurbished and tiled floor to ceiling, with shower, vanity and toilet. We love the hot shower outside too. The property is only 0.250km to the beach, an easy flat stroll so no need to drive. The town/village has a range of retail and services including a great massage team (highly recommended!). A supermarket, medical centre and a number of great cafe and bars. Off street parking down a private driveway. 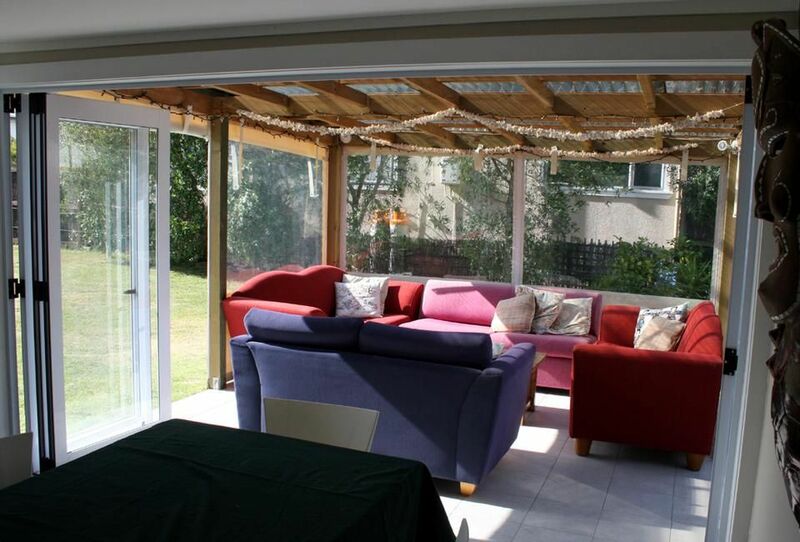 We spend most of our summer outdoors and have created a room with zip-down clear sides to let the sunshine in! Couches seat eight comfortably and can be moved in doors if you prefer. Fisher & Paykel full-size dishwasher. Basic pantry items available for use. Crocker and cutlery; ample for 10+ people. Well appointed kitchen with dishwasher, full oven and very well-stocked crockery, cutlery and most kitchen appliances. Outdoor fullsize gas BBQ. You shouldn't need to bring any equipment with you. The table is on wheels and can be moved outdoors for alfresco dining. CD player & USB port. Help yourself to the books in the library. A cupboard full of board games. Tennis Courts available for visitors in town; bring your own rackets. Two Golf Coursse in town; full 18 holes or smaller 9 holes. The property is perfectly located for the activities we enjoy in Whangamata. Quiet and private but within easy walking distance of shops and restaurants. We really enjoyed our stay in Janet's bach. It was great to have a separate sleeping area for children to go to bed early in a quiet space. The heated outdoor shower is also an excellent idea to rinse off when we came back from the beach - lovely! One of us is a keen cook and we really appreciated the full kitchen, fully stocked with herbs and spices, as well as condiments. Coming in from overseas, we were also grateful for all the cleaning products available to clean the kitchen and bathroom. Thank you, Janet, for your thoughtfulness in providing for our holiday needs. This property has served us perfectly for the last five years. This property has served us perfectly for the last five years. Homely and comfortable with everything we need onsite. Location is great, only minutes walk to the action but quiet and private at night. Hi Rob, trust you are well. Can you give me a call to talk about your booking for Beach Hop - which is confirmed for you. Book a Bach have changed booking engines and I don't have you details. I need number to call you. The bach was well equipped and in a great location. The bach was well equipped and in a great location. Found it great that the sleeping was in a separate area to the main dwelling meaning you could go to bed while others stayed up. Great place to stay. Clean tidy and good location. Whangamata has two golden sandy beachs; generally the surf is running and it is ideal for those looking to learn. Lessons and board hire are available in the town. Off the beach there are islands to explore and you can hire a canoe and a guide to show you the sights. If you prefer getting lost in nature, there are a number of great walks in the area including old gold mines. All are days walks for those with a general fitness level.